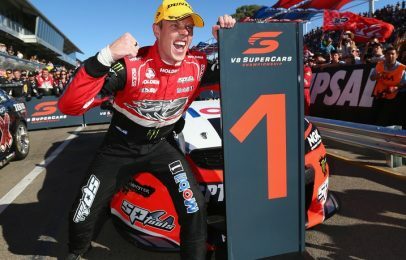 Polesitter James Courtney joined the prestigious list of multiple-time champions at the Clipsal 500 Adelaide on Sunday, holding off a furious charge from Shane van Gisbergen to win Race 3 of the V8 Supercars Championship. The No. 97 STIX Candy Holden Commodore of van Gisbergen was forced to settle for second place, while Courtney’s Holden Racing Team teammate Garth Tander claimed the final spot on the podium. The victory was Courtney’s 13th career V8SC win and second career at the season-opening race in Adelaide — and on the top step of the podium, New South Wales native was brimming with excitement. Courtney was so excited about the win that he lifted V8 Supercars TV Pit Reporter Riana Crehan in the air with a gigantic hug after his podium interview — not as surprising as Scotty McLaughlin’s moment in Adelaide one year ago, but still enough to get the fans going in the stands. The first third of the race was uneventful on-track, save for Fabian Coulthard dropping from second to fourth by the time the field came to turn two on the opening lap due to a poor jump off of the starting grid. But on pit road, the field was a frenzy, with pit stops for all of the drivers scattered across the start of the race as teams tried to strategize and put themselves in the best position for the run to the flag. It was on lap 24 that the first Safety Car was called. Erebus Motorsport’s Ash Walsh suffered electrical issues going into turn three, causing his No. 9 Erebus E63 AMG to stall out — and though he was able to refire the car from turn three, he would not be so fortunate a few moments later — when the car stalled out again in the middle of the back straightaway. As such, the yellow flags flew so that Walsh’s machine could be pulled back to the garage (where Walsh later said that the electrical issues that had plagued the dash caused the engine to misfire). The first restart came on lap 30, though green flag racing would only last for two laps. Lee Holdsworth added his name to the list of drivers that have fallen victim to turn eight at Adelaide, as he overdrove the corner entry and pancaked the wall with the left side of his Fuchs Air Conditioning Holden Commodore. The impact ruined the left side suspension of Holdsworth’s car, and he could only limp around to turn 10 before he was forced to pull over and the Safety Car was brought out once again. Surprisingly from there, the race went green from the restart on lap 35 to the end. As such, the drivers cycled through pit stops again and the set of contenders for the race victory became clearly identifiable. Courtney led all drivers through the cycle of pit stops, Tander had come through the cycle second, and van Gisbergen followed the two HRT cars close behind in third. The charge to the front for van Gisbergen began on lap 57, when Tander overdrove the final corner of the circuit and van Gisbergen slipped past him to take second. From that point, van Gisbergen quickly reeled in Courtney, and made the definitive move of the race on lap 61. The driver of the No. 97 attempted to pull off a pass on Courtney at turn nine, but drove slightly deeper into the corner than was necessary and accidentally bumped Courtney out of the lead. Realizing that he ran the risk of being called to pit road by race officials for a penalty, van Gisbergen willingly slowed to give Courtney the lead back. Little did van Gisbergen know that that was the last time he would see the lead in the race. Courtney was forced to hold off a massive run from van Gisbergen after the initial shunt in turn 9, but van Gisbergen wore his tires down too much before he could actually get around Courtney and began to lose contact with the rear bumper of the No. 22. Van Gisbergen was able to rally for a smaller run at Courtney in the final two laps of the race, but it was not enough to make the pass, and Courtney drove off to win the Sunday race in Adelaide for the second year in a row. Though he missed his chance at a second Clipsal 500 title in three seasons, van Gisbergen was relatively upbeat about his drive. While Courtney was busy winning the race at the front of the field, there was some drama in turn 10 on the final lap. Red Bull Racing Australia’s Jamie Whincup was racing side-by-side with Prodrive Racing Australia’s Chaz Mostert when Mostert tried to block Whincup’s pass attempt. In the process, Mostert spun around and came to a rest in the middle of the track — where Nissan Motorsport’s James Moffat was able to t-bone Mostert at race pace. Whincup later said that he had slowed down to avoid slipping in some oil that had been laid down on the racing surface and that Mostert cut in front of him, leaving Whincup with nowhere to go. Whincup would finish fourth; however, neither Mostert or Moffat were able to finish. With his victory, Courtney becomes the fourth driver in history to win the Clipsal 500 in back-to-back years, joining Whincup, Marcos Ambrose, and Mark Skaife. He also takes the points lead as a result, going 17 markers clear of Brad Jones Racing’s Fabian Coulthard, who won Race Two on Saturday. The V8 Supercars Championship continues March 12-15, when the series visits Albert Park to run an exhibition series of races as part of the Formula One Australian Grand Prix weekend. For more information on the V8 Supercars Championship, visit http://v8supercars.com.au/.